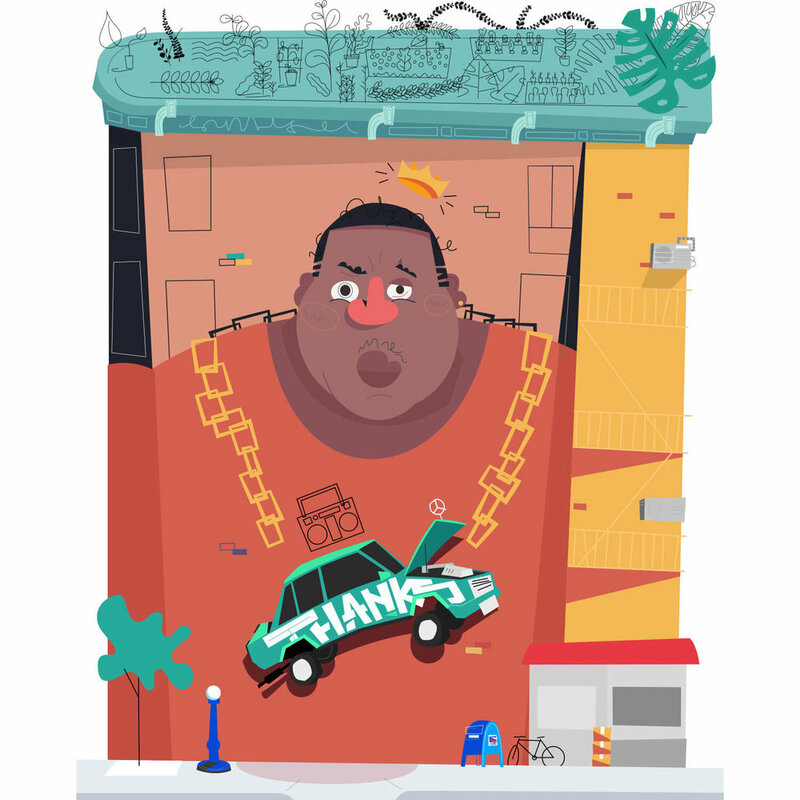 My reaction piece for a visit to New York, as well as an homage to Brooklyn art and culture. 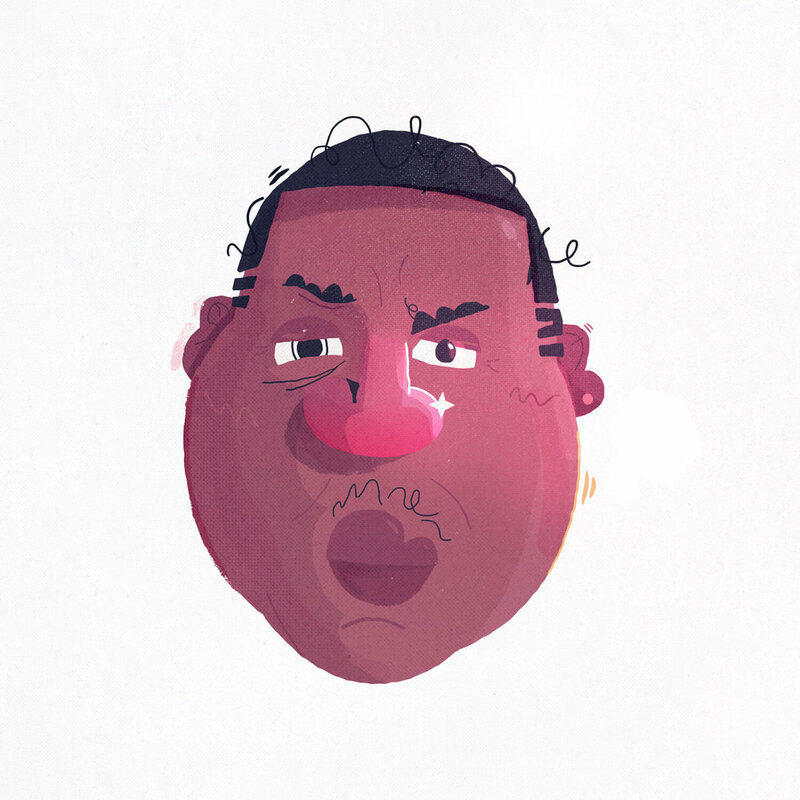 Part of my MFA in Illustration reaction series. 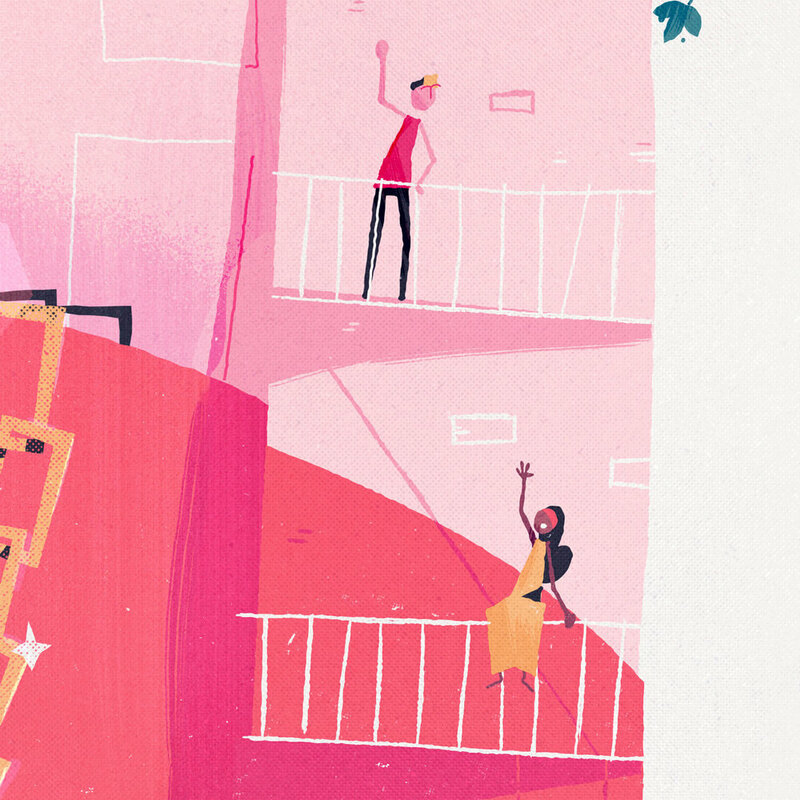 A few times a year, we have travel periods full of exploring the illustration world and culture around the United States. As a response to New York City, I decided to base my piece around a night out in Bed Stuy, Brooklyn. I was walking with a friend and my brother on a warm evening, just after dark, but still a busy time. People walking, getting their shopping done, some hanging out listening to music, etc. 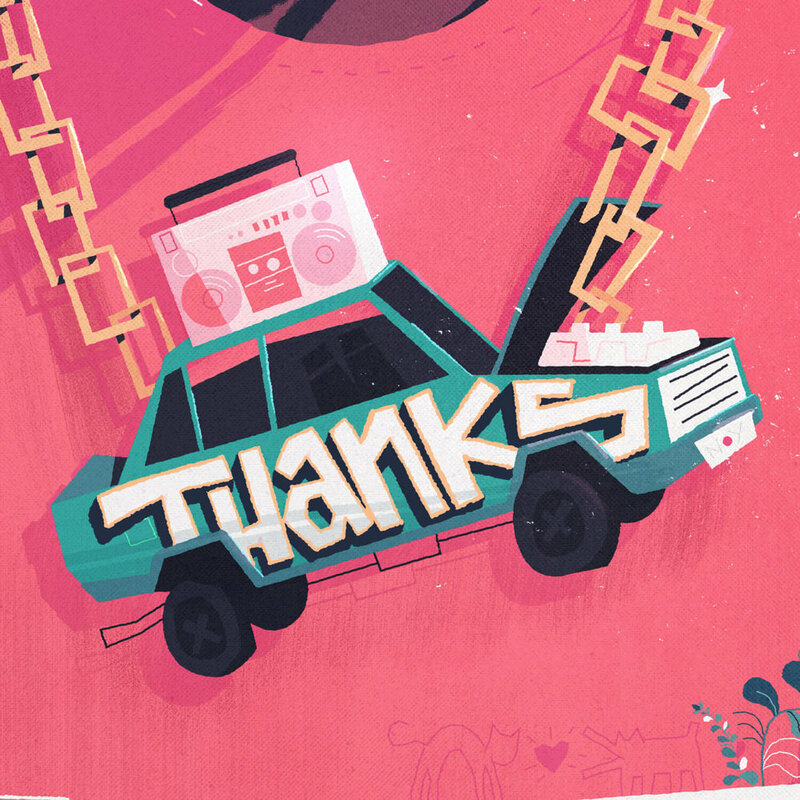 Nothing out of the ordinary for the neighborhood when I saw this art installment of a Mercedes with "THANKS" painted on it, with a boombox atop. I was charmed by its humbling affects and took a photo, maybe to be used later as reference. Moments later, I stumbled upon the wonderful and famous mural of Biggie. The two together felt serendipitous. I had this warming sensation that community was around. Despite the distancing from the culture that's occurred from economic division and gentrification, it felt like this area was really embodying the culture of art of all types. I started thinking, "Thanks".. that's nice. 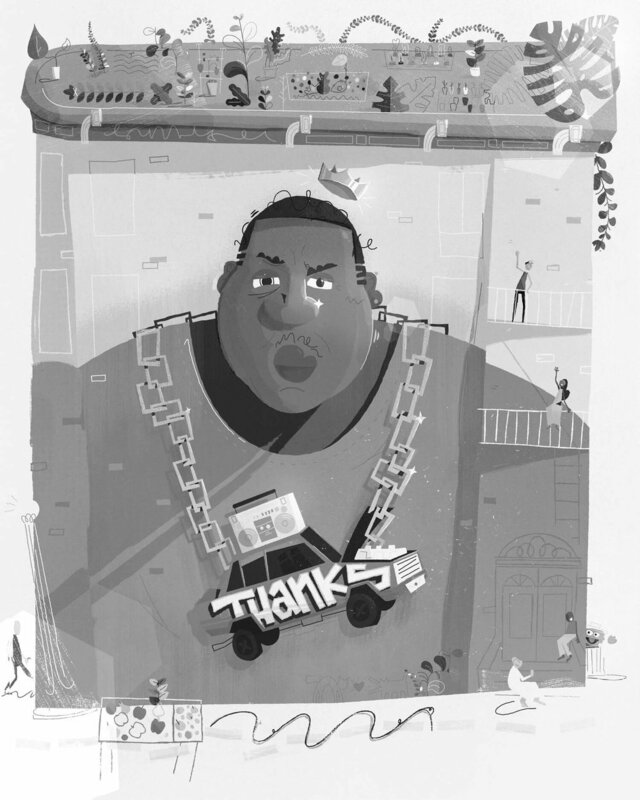 Thanks to Biggie, sure. But even more, thanks to New York for what you've done for art. 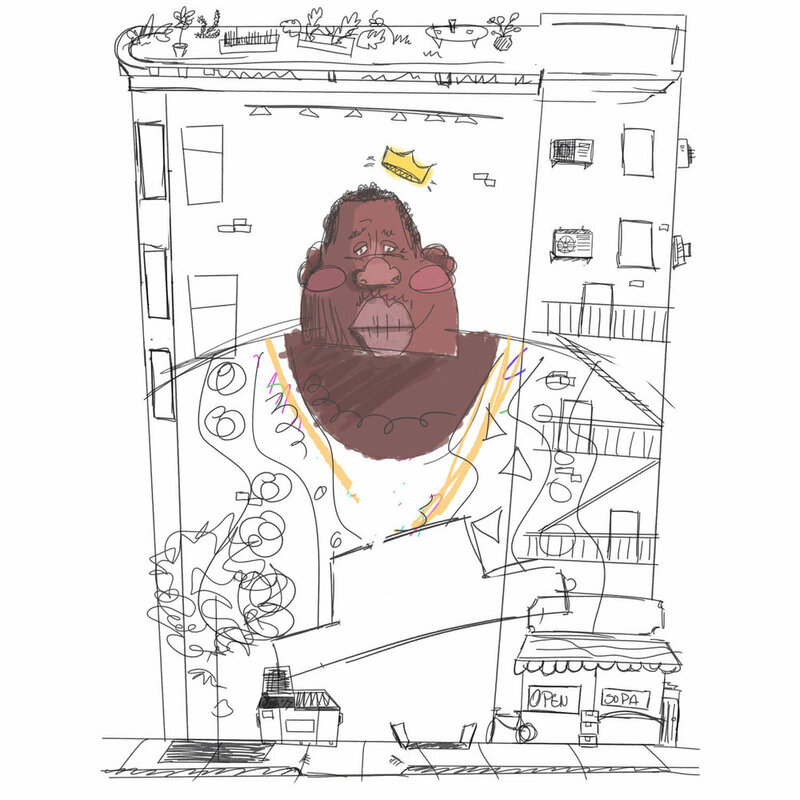 Thanks to Spike Lee for film and one of the most influential movies, "Do the Right thing". Thanks to Basquiat though not New York born, certainly not a stranger to the area. 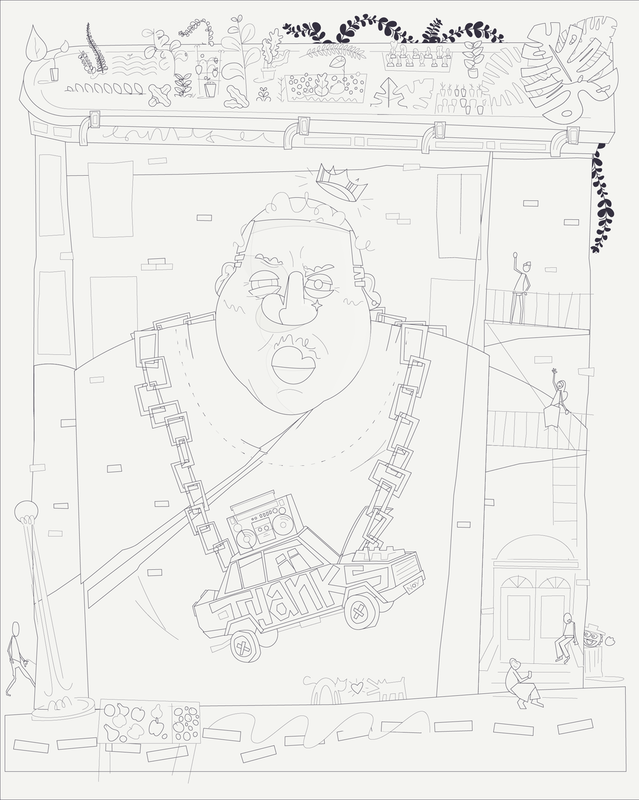 Combining references from all, and a twist on the photo we see of Biggie so often, this is my thanks to New York for cultivating the art and culture that makes it so wonderful. While working on this, I found it interesting to learn that the mural that inspired me was in talks of being torn down. The building owner wanted to add windows. Fair enough, your building I suppose. This did cause controversy and I was motivated further to help immortalize the piece and what it meant to me through this piece. Happily I discovered later that the building owner had a change of mind and it's still up (far as I know). I spent a lot of time working on simplifying this piece and using that as my personal challenge. Over and over I'd send comps off to friends asking where I could simplify and while that was very unnerving, they'd come back with 'Well what if we got rid of x or y?' and most of the time, removing always helped create the focus where it needed to be. Once all my shapes are worked out, I try to work in greyscale to get a decent value study. For this in particular, I had some trouble deciding where I want the eye to go first. 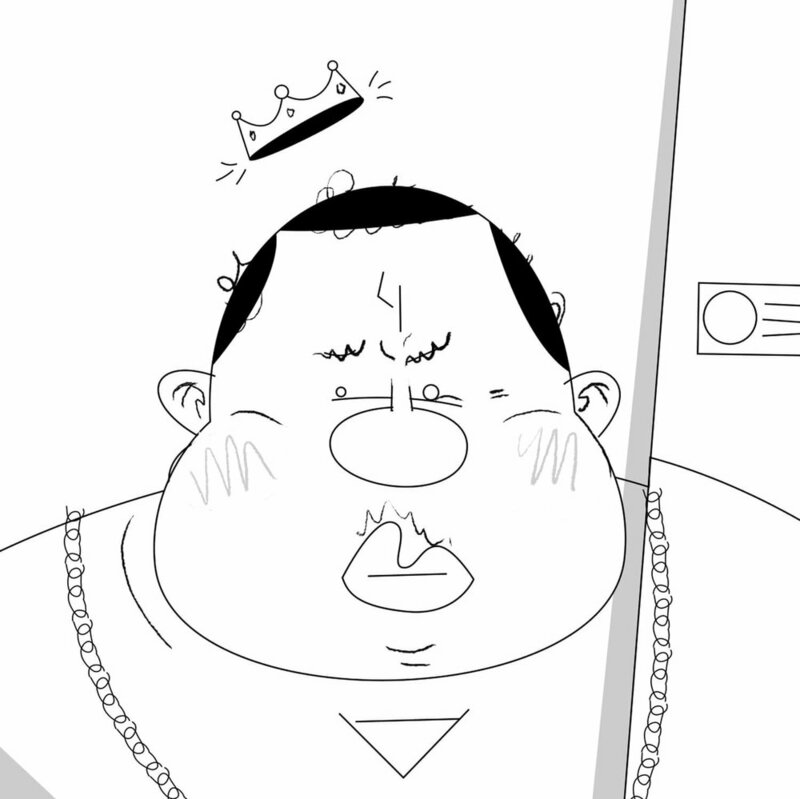 The goal here was to start at the eye of biggie, and follow his nose downward until it hit's the next highest contrast in value in proximity, which is the chain, pointing down to the secondary point of attention, "Thanks". From there I was hoping you'd be dragged down and around up to the roof gardens through the ladders climbing upward. 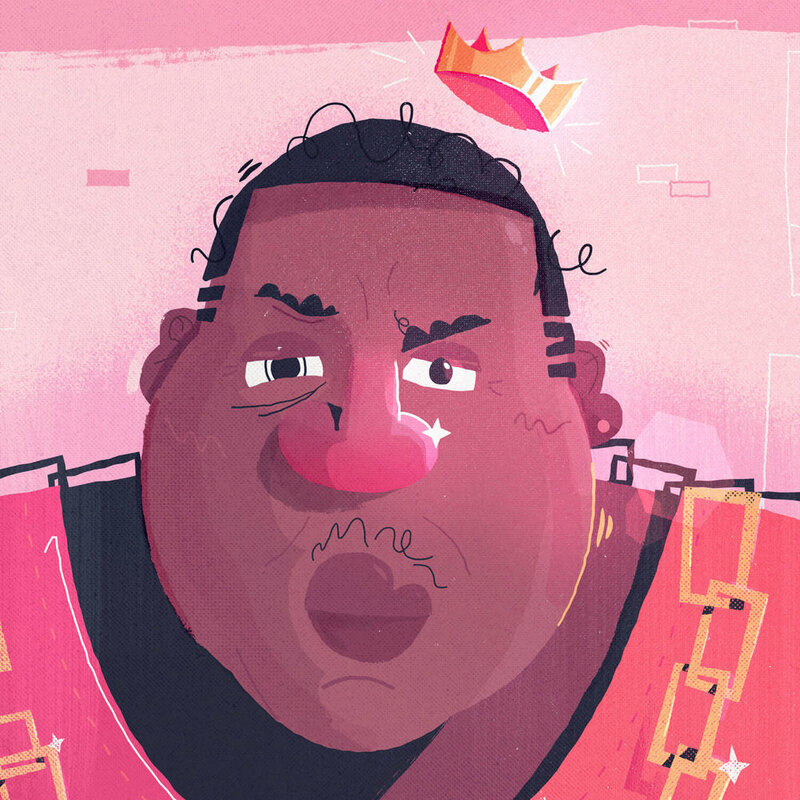 Getting Biggie's likeness was of course a tricky task, but luckily borrowing from such a culturally popular image, both in mural and photo form, I was able to play a bit and let things get weird. Knowing when to and when not to lean on certain crutches is a major component to success for me.